These rates are subject to change monthly. Share secured loans are available. The interest is 1% percentage point over the dividend rate paid on your shares in the previous quarter, subject to change each quarter. CD secured loans are available. The interest rate is 1% percentage point over the dividend rate paid on your CD, subject to change when your CD matures. If the interest rate on a Share Secured loan or CD Secured loan should change, the changed rate applies only to new loans, not loans currently enforced. 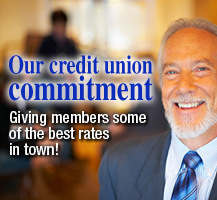 On new autos, the Credit Union will finance 100% of the MSRP (Manufacturer's Suggested Retail Price). On 2015 and newer used autos the Credit Union will finance up to the clean retail value, and on 2014 and older autos up to the clean loan value per NADA Official Used Car Guide, or 100% of sales price, whichever is less. Share/savings accounts are allowed one free withdrawal per quarter. Each additional withdrawal will be charged a $5.00 transaction fee. Dividends on share/savings accounts are paid quarterly and the rates may vary each quarter. The dividends are paid from income for the quarter and as income varies, so will the rate. The member will forfeit dividends that are accrued, but not paid in the event of an account closing. Current rate paid on all share balances $25.00 and above - these rates are subject to change quarterly. Current Certificate of Deposit rates. These rates are subject to change monthly. 1.00% 6 MONTH Early withdrawal penalty 60 days interest. 1.50% 1 YEAR Early withdrawal penalty 90 days interest. 2.00% 2 YEAR Early withdrawal penalty 120 days interest. Checks returned to the Credit Union due to insufficient funds will be charged a $25.00 fee.